1866. Mugi Viaduct on the Sao Paulo Railway. 1869. 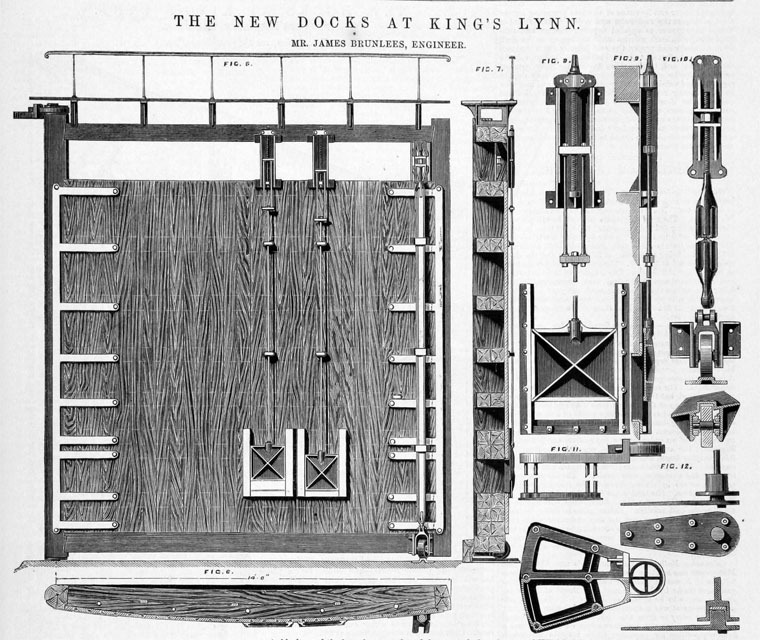 New Docks at King's Lynn. 1869. Docks for Bristol (Avonmouth). 1869. Viaduct over the Solway Firth. Sir James Brunlees (1816–1892) was a Scottish civil engineer. 1816 Born in Kelso in the Scottish Borders. In 1850, Brunlees worked on the Londonderry and Coleraine Railway. For this job he was obliged to build an embankment over Rosse’s Bay on the River Foyle, surmounting great difficulties. Brunlees was the Construction Engineer for the Ulverston and Lancaster Railway. This was a short but difficult and important railway to link the Furness Railway network to the Lancaster and Carlisle Railway line and thence to all points further south in the British network. The route was planned by McClean and Stileman at 19 miles in length of which ten miles comprised embankments and viaducts across tidal water. Much of this was sand running to a depth of 30 to 70 feet. This made it very challenging to build. In business terms the Manchester-based railway contractors John Brogden and Sons were the prime movers of this railway. The Ulverstone and Lancaster Railway Act received the Royal Assent on 24 July 1851 but work was not in full progress until September 1853 because workers and accommodation for them were not readily available. McClean and Stileman had resigned as engineers in the previous February so another engineer had to supervise construction. Brunlees was chosen because of his success with the River Foyle project. The line was opened on 26 August 1857. Brunlees wrote a paper on this project for the Institution of Civil Engineers in which he described the design profile of the embankments and a novel design of drawbridge for the viaducts to withstand the winds and waves. His work on the U&L earned him praise from men like Locke and Hawkshaw. Viaducts were built across the estuaries of the rivers Kent and Leven and these were designed and built by W. and J. Galloway and Sons of Manchester using a novel piling system involving waterjets. James Brunlees was the engineer of the Solway Junction Railway. This involved a 1 mile 8 chains cast-iron girder viaduct between Bowness-on-Solway and Annan across the Solway Firth in Scotland. It had 193 spans with 2,892 tons of cast iron for the piles and 1,807 tons of wrought iron. The Act of Parliament was passed in 1864 and the railway was opened in 1869. In 1875 and 1881 the viaduct was damaged by ice. In 1881 the damage was severe and there was a Board of Trade Inquiry. The inspecting officer said that because of the thickness of ice, the size of the ice-floes, and the absence of wind, it was not surprising that the cast-iron columns had not withstood the shock. This method of construction should be avoided in estuaries where the climate was subject to sudden changes in temperature and to blows from floating ice. He had no objection to rebuilding the viaduct but recommended modifications to prevent a repetition. Brunlees served as a railway engineer in the construction of the Mersey Railway, connecting Liverpool and Birkenhead, and the Sao Paulo Railway between Sao Paulo and Porto de Santos. He also worked in maritime engineering and was responsible for the construction of the docks at Avonmouth and Whitehaven as well as the piers at Southport and Southend. There is evidence that Brunlees also worked with the Brogdens on their New Zealand projects. He served as president of the Institution of Civil Engineers between December 1882 and December 1883. He was knighted in 1886. 1891 Living at Argyll Lodge, Wandsworth: James Brunlees (age 75 born Scotland), Civil Engineer - Employer - Widower. With his daughter Margaret A. Brunlees (age 43 born Manchester) and his son Howard Brunlees (age 32 born Kensington), Civil Engineer. Also his niece Alice B. Kirkman (age 50 born Bolton le Moor), Single, and his son-in-law Alexander McKerrow (age 53 born Manchester), Civil Engineer - Widower. Five servants. SIR JAMES BRUNLEES was born on the 5th of January, 1816, at the border town of Kelso, where his father was gardener and steward to the late Mr. Innes, agent to the then Duke of Roxburgh. At six years of age he was sent to the parish school and subsequently to the only private school in the town, which was kept by a Mr. Scott, under whom he made rapid progress, especially in arithmetic and elementary mensuration. He was taken from school at the age of twelve and put by his father to gardening and farm work with the idea that he should become a landscape gardener. About this time he came into contact with Alexander J. Adie, who was making frequent visits to Mr. Innes, in connection with road-surveys and other improvements on the Roxburgh estates. He accompanied Mr. Adie on this work and the useful assistance he rendered that gentleman was acknowledged by the presentation of a theodolite, with which young Brunlees afterwards made in the summer evenings a survey of Broomlands farm. On showing his plan, when finished, to Mr. Innes, he was instructed to make a survey of the Duke’s property. This he accomplished satisfactorily, and by working early and late saved in the course of time sufficient money to enable him to attend classes at the Edinburgh University for several sessions. In 1838 Mr. Brunlees was engaged by Mr. Adie as an assistant on the construction of the Bolton and Preston Railway, now forming part of the Lancashire and Yorkshire system. His salary was £40 a year, and in order to qualify himself still further, he devoted all his spare time to study and took every opportunity of going over the works with the inspectors and of thus gaining a practical knowledge of details. He then obtained an appointment on the staff of Locke and Errington and assisted in the laying out of the Caledonian line from Beattock to Carstairs and the branches to Edinburgh and Glasgow. On the completion of this work he became Acting Engineer, under the late Sir John Hawkshaw, to the Lancashire and Yorkshire Railway Company, which post he held for about six years. In 1850 he was Engineer for the construction of 36 miles of the Londonderry and Coleraine Railway in the north of Ireland. This involved the formation of an embankment across Rosse’s Bay in the River Foyle, which work was attended with considerable difficulty owing to the unusual depth and the treacherous nature of the alluvial deposit round the bay. In 1851 the Ulverstone and Lancaster Railway was incorporated, the object being to complete a direct line from Whitehaven and the west coast of Cumberland to the south of England. Mr. Brunlees was appointed Engineer, and the important sea-embankments and iron viaducts in Morecambe Bay, across the estuaries of the Kent and Leven, which he constructed for that railway, were described in Papers presented by him to the Institution in 1855 and 1858. In these viaducts he introduced a novel form of pile as better adapted to the situation than the ordinary screw-pile. 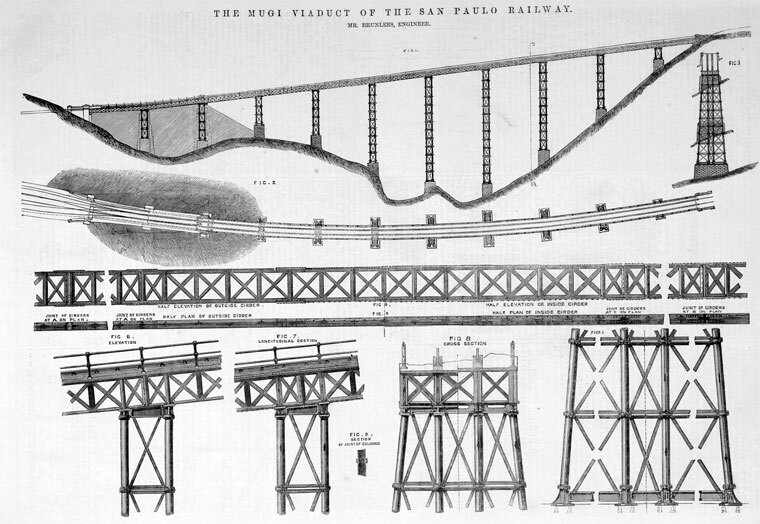 The next work of Mr. Brunlees was the survey and construction of the Sao Paulo Railway, one of the important Anglo- Brazilian lines. This was placed in his hands at the beginning of 1856 by Baron de Maua, the principal concessionaire, and he was charged with the preparation of the plans and sections and of the report and estimates necessary for the organization of a company in England. Under the terms of the concession the line was to commence at Santos on the coast, pass through the city of Sao Paulo, and terminate at Jundiahy, a distance of about 88 miles. The preliminary surveys were made by D. M. Fox, who was sent out by Mr. Brunlees and who subsequently acted as principal Resident Engineer during the construction of the line. This work was described by Mr. Fox in a Paper read before the Institution in March 1870. One of the chief difficulties was the construction of a first-class railway up the precipitous sides of the 'Serra do Mar,' which runs parallel to the sea-coast in a direction at right angles to that of the line and rises abruptly to a minimum height of 2,500 feet above the sea-level. It was not possible to lay out, within the limit of the prescribed capital, an ordinary locomotive line over the Serra. 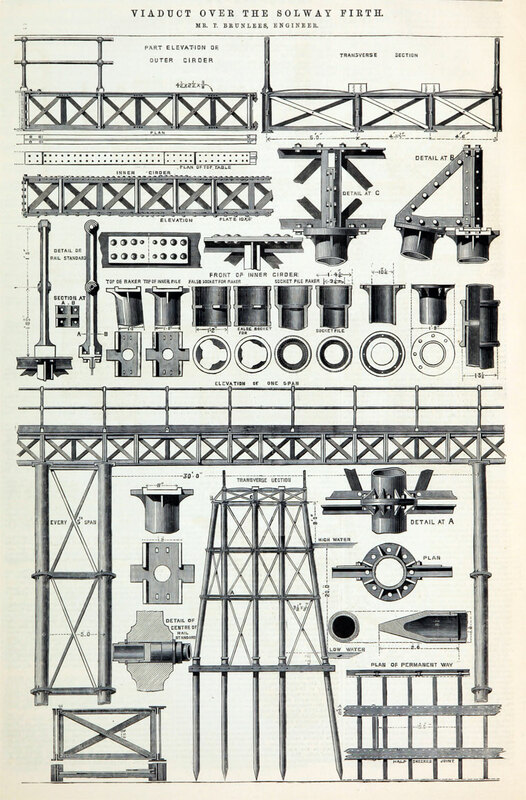 Mr. Brunlees determined therefore to adopt inclined planes with a gradient of 1 in 10, to be worked by stationary engines, and these planes are the distinctive feature of the railway. On the completion of the line he received from the Emperor of Brazil the Order of the Rose. In 1865 Mr. Brunlees was appointed Engineer to the Mont Cenis Summit Railway, the concession for which, however, was to lapse an the opening of the Mont Cenis Tunnel line. The summit railway was 50 miles in length and connected St. Michel, the terminus of the Victor Emmanuel line in Savoy with Susa in Piedmont, the terminus of the railway system in the north-west of Italy. It was worked on the Fell central-rail system. A brief description of the line was given by the late Charles B. Vignoles in his Presidential Address to the Institution. Amongst other railways for which Mr. Brunlees acted as Engineer in the course of his long career may be mentioned the Lynn and Sutton, and the Spalding and Bourn, now forming part of the Great Eastern and the Great Northern systems ; the Solway Junction ; the Cleveland Extension line in the North Riding of Yorkshire, with a viaduct of thirteen spans and 180 feet high over Skelton Beck; and, in conjunction with Mr. (now Sir) Douglas Fox, the Mersey ; the Southport and Cheshire Lines Extension ; the West Lancashire ; and the Liverpool, Southport, and Preston Junction. The most important of these, the Mersey Railway, with its tunnel under the river between Birkenhead and Liverpool, was described by Francis Fox in a Paper presented to the Institution. On the completion of the work in 1886 Mr. Brunlees and Mr. Douglas Fox, the joint engineers, received the honour of knighthood. In addition to these lines the following are some of the railways abroad to which Mr. Brunlees was Engineer :- The Minas and Rio in Brazil ; the Central Uruguay and Hygueritas ; the Porto Alegre and New Hamburg; and the Bolivar, which serves the Aroa copper mines in Venezuela. The work of Sir James Brunlees was not, however, confined to railways. 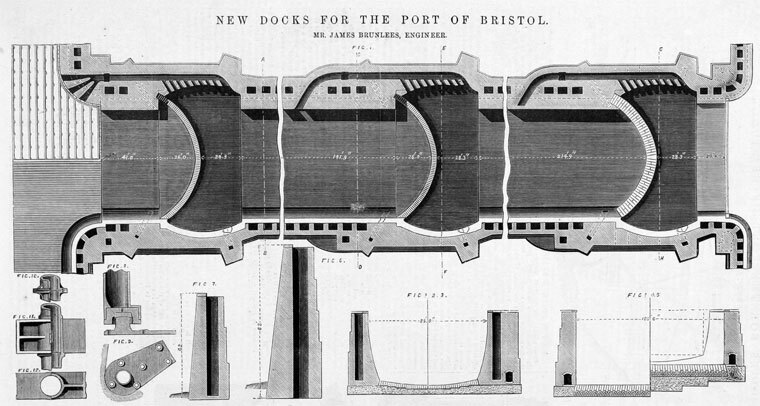 For many years the port of Bristol, at one time second only to that of London, had been suffering severely from want of sufficient dock accommodation. Large vessels, if they happened to arrive during neap tides, had to remain at anchor in the roadstead at the mouth of the Avon, waiting for spring tides to give sufficient depth of water in the approach to the docks, and there was also the risk of navigating the narrow and tortuous course of the River Avon from the Bristol Channel to the city. Although several plans had been submitted from time to time by eminent Engineers, the Town Council had been invariably divided in opinion and consequently no steps had been taken to carry any of them into effect. At length Mr. Brunlees was consulted, and he recommended the construction of a dock at the mouth of the river which should cover an area of about 16 acres. His scheme was accepted and an Act of Parliament obtained. The first sod was cut on the 26th of August, 1868, and on the 24th of February, 1877, the Avonmouth Dock was opened for traffic. An account of the work was presented to the Institution in the following year by the Resident Engineer, J. B. Mackenzie. A report made by Mr. Brunlees to the Directors of the Bristol Port and Channel Dock Company in 1871, may be found in the library of the Institution. In connection with this work he designed and constructed the Clifton Extension line, which brought the dock into connection with the Great Western and the Midland Railway systems. Mr. Brunlees was also Engineer to the Whitehaven Dock Works, described by J. Evelyn Williams, the Resident Engineer, in a Paper published at the same time as the account of the Avonmouth Dock. 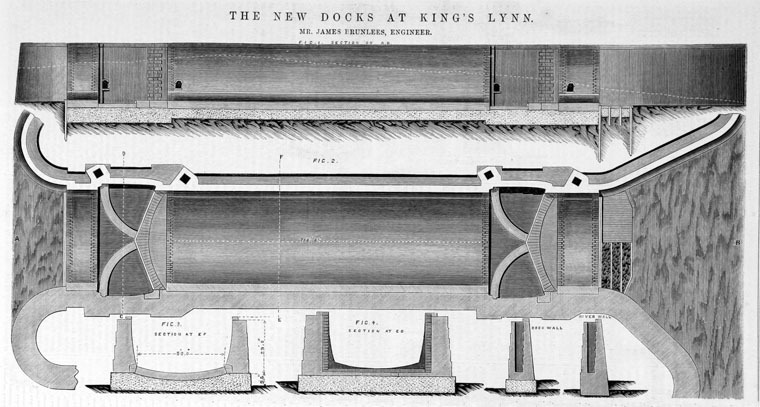 The works were designed and carried out by Mr. Brunlees, and, in addition to a wet dock and railway, included the construction of new piers in the harbour and the carrying out of other important improvements in connection with the port. In the library of the Institution is a report he made to the Town and Harbour Trustees in January 1870. He also designed and constructed the Lynn Dock in Norfolk which covers about 6.5 acres. In addition to railway and dock work, Sir James Brunlees designed and erected piers at Southport, Llandudno, New Brighton, and Southend ; that at Southport being 0.75 mile long and that at Southend 1.25 mile long. Amongst other works constructed from his designs may be mentioned two bridges across the River Ouse and the system of water-supply and drainage in operation at Kelso, his native town. In conjunction with the late Sir John Hawkshaw, he was Engineer to the original Channel Tunnel Co from its incorporation in 1872 until 1886, when it ceased to exist as an independent company. In addition to an extensive Parliamentary practice, he frequently acted as arbitrator in cases in which important railway interests were involved. Sir James Brunlees died, after a long illness, on the 2nd of June, 1892, at the age of seventy-six years. In disposition he was reserved and quiet, but steady and unswerving in his friendships and ever ready to do a kindly action or to extend a helping hand. By hard work, untiring energy and marked self-reliance he raised himself from a comparatively humble position and achieved distinction and honour as an Engineer of recognized worth and ability. He was elected a Member of Council in 1865, a Vice- President in 1878, and served the office of President during the session 1882-83, delivering on the 9th of January, 1883, an Address2 dealing mainly with the most important engineering works recently completed or then in progress. Sir JAMES BRUNLEES was born at Kelso, Roxburghshire, on 5th January 1816. After leaving school he was put by his father to gardening and farm work, with the intention of his being trained as a landscape gardener; but having a desire for higher culture, and having himself earned enough to carry out his wish, he went to Edinburgh University for two sessions, and there became known to Mr. Alexander Adie, by whom he was engaged in 1838 as his assistant on the Bolton and Preston Railway, one of the earliest lines constructed in this country. Subsequently he joined the staff of Messrs Locke and Errington, and took an important part in the laying out of the Caledonian line from Mattock to Carstairs, with branches to Edinburgh and Glasgow. On the completion of this work he was occupied on the Lancashire and Yorkshire Railway as acting engineer, under Sir John Hawkshaw, engineer-in-chief. In 1850 he went to Ireland to engage in constructing the Londonderry and Coleraine Railway. Two years later he undertook the difficult work of the Ulverston and Lancaster Railway across Morecambe Bay, which involved heavy embankments and several iron bridges. Subsequently he became actively engaged in engineering work of all kinds, both at home and abroad, in addition to acting as arbitrator in the settlement of disputed contracts and other railway matters. Among the principal works he carried out were the Solway Junction Railway, which included a viaduct of a mile and a quarter in length over the Solway Firth; the Clifton Extension Railway; the Mersey Tunnel Railway between Liverpool and Birkenhead, in connection with which he received in May 1886 the honour of knighthood; the Mont Cenis Summit Railway, involving very steep gradients; the Avonmouth, King's Lynn, and Whitehaven docks; the Southport, New Brighton, and Llandudno piers, and the new pier and pavilion at Southend; the Central Uruguay, San Paulo, Bolivar, and other railways in South America and elsewhere. He was also joint engineer with Sir John Hawkshaw for the Channel Tunnel scheme. He became a Member of this Institution in 1870. He was a Past-President of the Institution of Civil Engineers, and a Fellow of the Royal Society of Edinburgh. His death took place at Wimbledon on 2nd June. 1892; in the seventy-seventh year of his age. Sir JAMES BRUNLEES, who died at Wimbledon on June 2, 1892, in the seventy-seventh year of his age, was born at Kelso, Roxburghshire, on January 5, 1816. After leaving school he was put by his father to gardening and farm work, with the view to his taking up the duties of a landscape gardener. This occupation, however, was not congenial to his tastes, and having himself earned enough to carry out his wish, he went to Edinburgh University for two sessions, and there took up civil engineering, being first employed in 1838 as assistant to the late Mr. Alex. Adie on the Bolton and Preston Railway. At a later date he joined the staff of Messrs. Locke & Errington, and took an important part in laying out the Caledonian line from Beattock to Carstairs, with branches to Edinburgh and Glasgow. On the completion of this work, he was offered the post of acting engineer on the Lancashire and Yorkshire Railway under the late Sir John Hawkshaw, engineer-in-chief. In 1850 he went to Ireland, where he was employed on the Londonderry and Coleraine Railway. Two years later, he undertook the engineering work of the Ulverston and Lancaster Railway across Morecambe Bay, which involved heavy embankments and several iron bridges. In addition to acting as arbitrator in the settlement of disputed contracts and other railway matters, Mr. Brunless carried out a number of public works, including the Solway Junction Railway, which comprised a viaduct of a mile and a quarter in length over the Solway Firth ; the Clifton Extension Railway ; the Mersey Tunnel Railway between Liverpool and Birkenhead (in connection with which he received, in May 1886, the honour of knighthood) ; the Mont Cenis Summit Railway (which involved very steep gradients) ; the Avonmouth, King's Lynn, and Whitehaven docks; the Southport, New Brighton, and Llandudno piers, and the new pier and pavilion at Southend. Among his principal works abroad were the Central Uruguay, San Paulo, Bolivar, and other railways in South America. Sir James was joint-engineer with Sir John Hawkshaw for the Channel Tunnel scheme. He became a member of the Institution of Civil Engineers in 1872, and at a later date he was elected to the office of President of the Institution. He was also a Fellow of the Royal Society of Edinburgh. He joined the Iron and Steel Institute in 1872, but seldom took any part in its deliberations. This page was last edited on 21 January 2018, at 18:59.